UPDATE: THIS GIG IS CANCELLED!!!!! Well, the promoters Meisan Events are at it again, after their last effort with Shaggy in November, they're throwing a party at Zouk this Wednesday 28th from 9pm. The main draw is Noodles from the band Groillaz - think Electronic Rock music and thats the sort of genre you'll get. 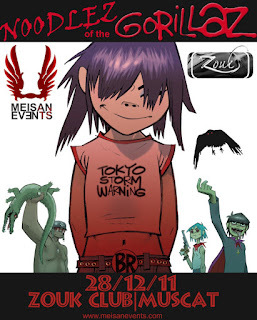 Now, I'm not entirely sure who exactly this Noodles girl is (because all 4 characters from the band Gorillaz are made up), seeing as Noodles was a character created by Damon Albarn and Jamie Hewlett, so I'm just going to assume it's going to be Miho Hatori who sings the vocals for the character Noodlez. Tickets are RO 20 on the door according to the Facebook event page, and the party runs till 3am - the latest licensed venue in the city that I'm aware of (most cut out at 2am). "I'm happy....I'm feelin' glad. I got sunshine....."
One of the most genius of collaborations. Any idea what the dynamic Damon Albarn or Blur are getting up to lately? I would fly anywhere to see a retro-style Blur gig!